All of my flexible, food safe, silicone molds are handmade by me, as they are ordered. I use a generous amount of silicone so your molds are thick and sturdy. ♥ Price is only for the mold. Any items in the pictures are photo props only. No Mold Release is necessary. 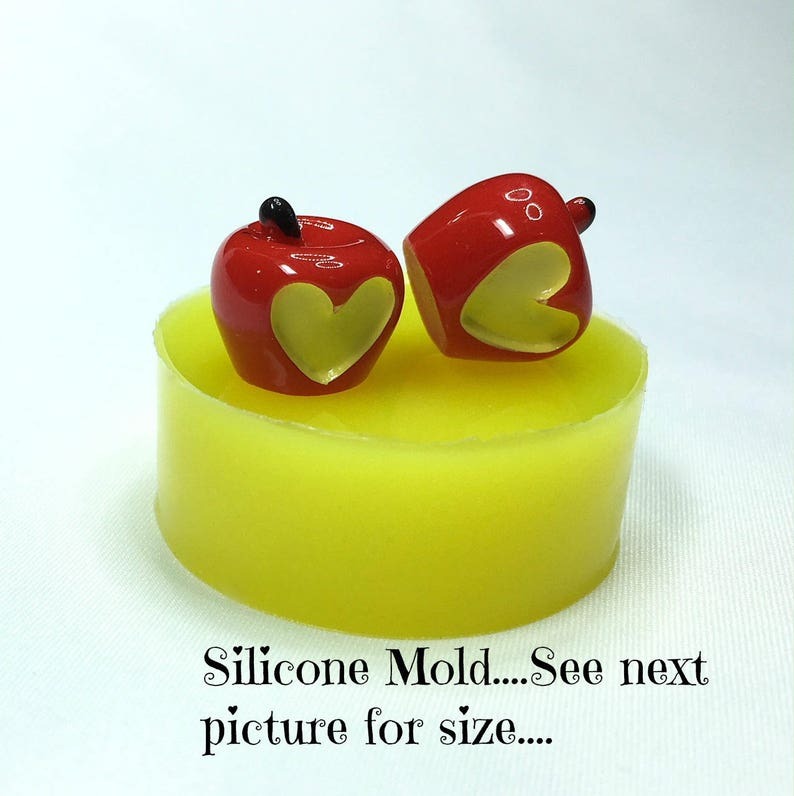 Your molded piece will pop right out of your mold without difficulty. My molds are very flexible. They can withstand heat up to 350 degrees Fahrenheit. My molds are food grade compliant up to 350 degrees F. They are made of non-toxic, food safe silicone. You may gently wash your mold with soap and water. ************* If you plan to use the mold for food, do not use it with any other material before putting your food product into the mold to eliminate any possibility of contamination. Please check the size of your mold prior to purchase so you are not surprised when it arrives. You can see the size of your piece ABOVE, in the PICTURES to the RIGHT SIDE of the large picture. Click on the picture with the RULER to enlarge it. If there is no size reference please send me a note and I will measure it for you. RESIN - You can use your molds with resin to make cute magnets, ornate brooches, and cabochons for jewelry, hair bows, pendants or scrapbook embellishments! POLYMER CLAY and PMC (Precious Metal Clay) also work well with these molds to create beautiful jewelry pieces! On some of the more detailed, deeper molds you can bake your clay right in the mold if you like to avoid distorting the piece as it comes out. Follow clay cooking directions on your clay package. Never bake the mold over 395 degrees. WAX - A lot of customers make scented WAX melts with their molds! Wax just pops right out of the mold cavity! SOAP embeds are another wonderful use of your molds. Make tiny fish, flowers or whatever you like to embed in your clear soaps! FONDANT, SUGAR, CHOCOLATE, CANDY (below 395 degrees) I make cute pieces to put on my cupcakes and cakes! Leaf and flower molds can turn an ordinary cake into a beautiful work of art! BUTTER pats! Make heart butter pats for Valentine’s Day, Eggs for Easter or snowflakes for Christmas! I have a variety of holiday molds to make your holiday dinner more festive! On some of the more detailed molds you can put your filled mold in the freezer for a couple of minutes to harden it a little to eliminate distorting your piece as you remove it. UTEE, FRIENDLY PLASTIC, PLASTER AND EPOXY CLAY can be used in your new mold! The molds are not edible. Please keep molds away from children. Smaller molds can be a choking hazard. Be sure to avoid CROSS CONTAMINATION. If you use your mold with non edible products (i.e. clay, resin etc) do not use it afterwards with food products. Other items I carry: Cookie cutters have sharp edges, please keep away from children. All the clay canes are made of clay and are not edible. Please keep these away from children. ALL the mini food decorations in my store are FAKE FOOD made of plastic, glass, clay or other non-edible material. Please keep these items away from children as they look good enough to eat but are not edible.